Freeze keeps track of your vaults' inventories and makes them easily browsable and searchable. Save a few bucks by deleting duplicate archives from your vaults. Freeze can highlight them for you. 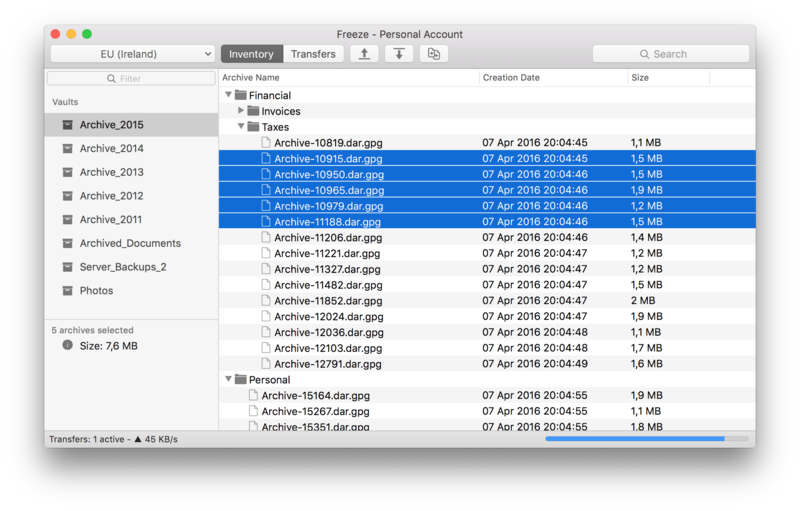 Drag&drop folders from Finder to your vault, and Freeze will synchronize these folders with the destination by only uploading new and changed files. You can also choose to delete orphaned archives. Upload and download transfer bandwidth can be throttled separately. Bump the overall transfer speed by transferring multiple files in parallel. Add as many accounts as you want. Your secret keys will be stored securely in your macOS Keychain. Freeze supports multipart uploads. Huge files will be uploaded in smaller chunks in a reliable way. Don't worry about an unreliable network connection. Freeze can resume interrupted uploads and downloads. No proprietary encoding of archive descriptions. No proprietary encryption or compression features that would make it complicated or even impossible to use other clients. Freeze automatically decodes archive descriptions from archives previously uploaded with FastGlacier, CrossFTP, CloudBerry or Synology NAS. Amazon Glacier is an extremely low-cost storage service for infrequently accessed data, which makes it perfect to store data archives or backups (although Freeze is not a backup solution, see the FAQ for more information). Please visit the Amazon Glacier Getting Started Website to get all the information you need. It only takes minutes to sign up for Amazon AWS, and you only pay for what you use. Go to the Amazon Glacier Website and visit "Create an AWS account" to sign up. Freeze will ask for your Amazon AWS credentials (Access key and secret key) when you start the app for the first time.